Duolingo Review – Learn Spanish, French, German and Other Languages For Free! What Is Duolingo All About? Duolingo is probably the most popular language game in the Universe. It is a website and an app that makes language learning easy, fun and free. Duolingo is a “game” where you earn points when you have learned new words and skills. The more you learn, the more points you will earn and the better you get ranked among your friends and followers. Who Is the Duolingo for? In my opinion, Duolingo is the best for the total beginners and for those who have only a little experience with a language they are learning. It can be profitable for the advanced students too but I think that the benefit is greatest when you are just beginning with a language. If you have 0 experience of learning a new language, then Duolingo is perfect for you. I didn’t know anything about speaking German and I started with Duolingo. I did the same before with French. Many young people nowadays like using their smartphones. If you like using your smartphone, why not to take a full benefit of the time you are using it. Then you can have fun and benefit at the same time. What Are the Main Benefits Of Using Duolingo? Duolingo builds up your vocabulary and keeps you motivated day by day. I got a row of studying about 100 days German in a row because of Duolingo. I wanted to continue the streak, so I kept on learning there. One greatest benefits of Duolingo is that it can motivate many people much better than old and stinky textbooks. Duolingo builds up your vocabulary little by little. First, you learn the basic phrases like, “Hello, how are you?” “How old are you?” “My father is James.” and so on. Then they have sections for many different subjects: Weather, sports, religion, hobbies and much more. You can also learn grammar in Duolingo. They will have sections for different kind of grammatical subjects. Verbs in the present, past, and future. With German, they go through cases. You learn vocabulary by doing exercises. If you write a sentence in a right form, you’ll get XPs. If you make a mistake, you’ll not be rewarded. I am a very competitive person. I like growing better day by day. That’s why Duolingo’s Leaderboard motivated me when learning languages. 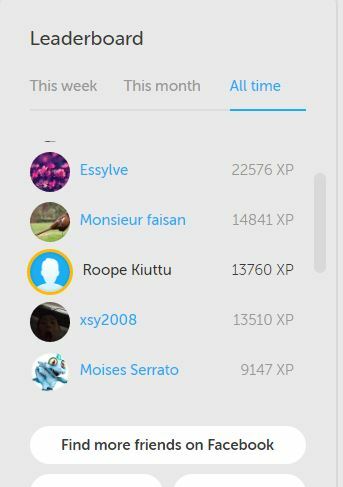 It shows how many XPs you have earned in Duolingo compared to people that you follow. You don’t need to know anyone of them personally, but you can see their points just by clicking “Follow” in their profile. You can see Leaderboard for This week (starting from Monday), This month (starting the first day of every month) and All time (See the picture on the right). What Are the Cons of Duolingo? It’s hard to find any cons there, but if I compare to some other language learning providers that are using natural methods of learning, there are some things that could be improved. In Duolingo you learn sentences (and sometimes) only individual words. That is not always the most efficient way of learning. 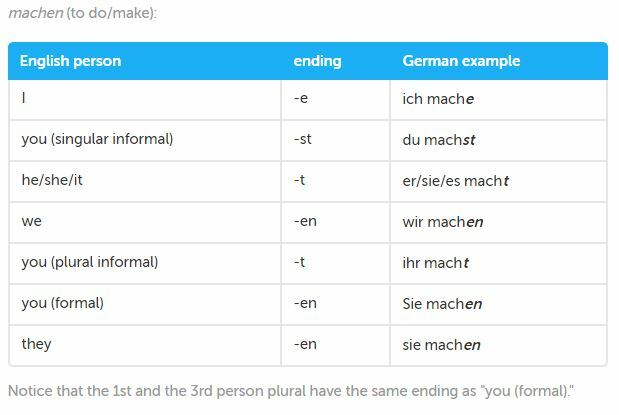 For example, in Leicht Deutsch Lernen (Review coming soon) you learn language by reading full stories when you learn words and sentences because of their natural context. Also, if you are learning a new language with a language partner, you can learn many words because of the context. In Duolingo you have words put into natural sentences but there is not a whole story which would make words easier to remember. I am not sure how it would work if Duolingo would build entire stories around their language app. Probably it could be worth trying. Yes, it is. Maybe you are wondering how it is possible. Duolingo doesn’t have any ads on their website; they are not charging users anything. So how on earth they can run their business?? The answer relies on their “Immersion” -section. There you can translate texts to another language. 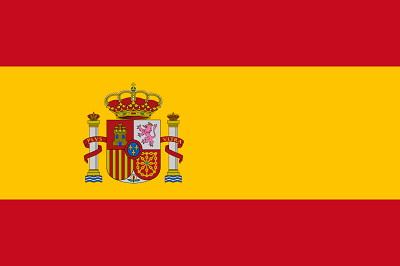 For example from English to Spanish or vice versa. You can decide how much you translate. 0 words, one sentence, a few sentences or even the whole text. Then you will gain a lot of XPs because of doing that. You will move up in rankings and at the same time improve your written and translation skills. Duolingo sells these translations for them who bought the translation. Member does it for free, and then they sell it. That’s how Duolingo gets some money to run their business. I like the business model there. It’s a win-win situation. Duolingo’s success is not a coincidence. It’s very rare that you get something so high-quality for totally free. In many language learning apps you can try it for free, but if you want a full-access, you need to pay for it. In Duolingo, you can get all the features for $0. That makes it different. If somebody says that learning languages are hard, show him Duolingo. If he says that he is not learning very well in Duolingo, ask him to earn 5000xp. What he needs to do that is nothing but play the game. If after earning 5000xp, he still hasn’t learned anything, I don’t believe he is a vegetable. It’s impossible to play Duolingo without learning anything. You play the game and learn. That’s just simple as that. What are your experiences with Duolingo? Which languages did you study with Duolingo? Was it very beneficial? Leave a comment below! Hey Roope, great review! Duolingo seems like a really great way to learn a language when you are a total newbie. I am going to check it out. The two things you said that I like the most are that it is like playing a game (I’m huge into video games) and that there is a competitive side to it. I like being at or near the top on any leader boards I’m a part of. Being on the phone is great since that’s what I use most of the time. I’m just wondering, can you also do it on the computer? yes you can do it on the computer too. Most of the time I use Duolingo on the computer because then you can type faster and probably learn faster. Some people prefer to use it with a phone app. I like also the fact that with Duolingo you don’t really feel like studying because you are collecting XPs and like playing a game. It makes learning easier and fun. Very nice review, I thought it was very thorough! I think Duolingo is a very good tool for beginners, I use it a lot whenever I begin learning a language, and it gets you started very easily in any of the languages it offers, but I believe, as one learns more and more of a language, that one should branch out from just this tool, as it doesn’t really teaches you how to speak. yeah, Duolingo is the best in the beginning of the language leaning journey but it’s not enough for becoming a fluent speaker like you said. Then it would be good to use tools like LingQ, Mimic Method and Baselang. Duolingo is a great starter for someone who’s a begginer and someone who’s still learning the language. For me, the strong point of this website is that you learn a lot of vocabulary really fast, grammar is secondary in that way, but it still has some lessons about it. I would recommend using Duolingo and anotther website or even a regular study book for getting to know a language at its full. I totally agree that vocabulary expands by using Duolingo. In addition, you’ll learn the most important grammar principles at the same time. Another great resource is LingQ. I really love Duolingo, like alexanderzx said, it is a great way for a beginner to start. It’s engaging on so many levels and goes so far beyond the usual memorization of vocabulary lists– it actually helps you apply what you’ve learned. In a classroom setting, the application usually means you’re stuttering through words with someone who’s at the same level as you, or with a teacher that’s far beyond you, and neither of those are great options. Duolingo meets you where you’re at, walks you through application, and helps you stay on top of everything you learn. It does have its limits, but it will give you a running headstart on any language you want to learn. 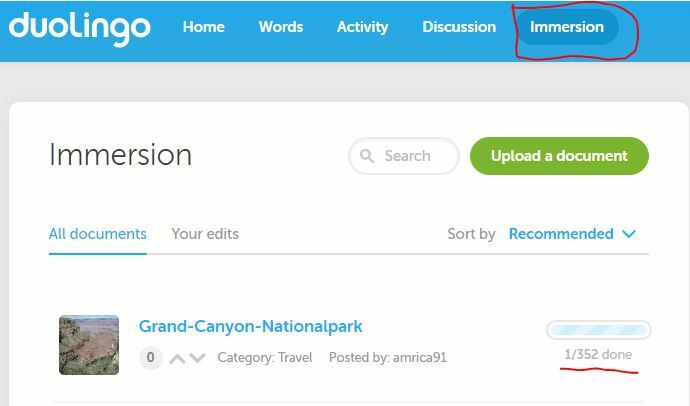 Another language site you could review is Memrise! I use that one in conjunction with Duolingo. Yeah, Duolingo gives a great start for learning a new language. I can highly recommend it in the beginning. It’s also useful if you travel to a new country and want to know some basics. I have actually written a few articles of Memrise. You can read them here: How to Use Memrise to Learn a Language Quickly? and Memrise vs Duolingo. it’s interesting to hear that you enjoy grammar books. In my experience people don’t like nowadays studying grammar so much. I think you can learn it kinda “automatically” while studying a language with other methods. Of course, studying grammar from a book or by watching YouTube videos can help you to learn it faster. I know about Duolingo, I even know that this language learning app can help you learn various languages and the best part is it is free to use. However, I have not used Duolingo. I have this desire to learn foreign languages, however, I don’t have time. I am driven by a primary motive that I should first brush up my English skills (English is also a foreign language for me). When I get away from stilted English, then only I can try other foreign languages. Yeah, one of the greatest benefits of Duolingo is definitely the fact that it’s completely free. Usually this kind of apps cost some money. However, Duolingo has become the most downloaded language learning app in Google Play store because people can use it for free. To people who want to invest a few dollars for their language learning I usually recommend LingQ. In my opinion, it’s even better than Duolingo. 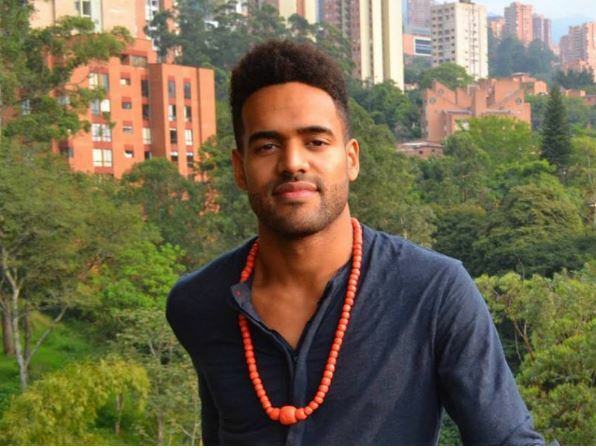 I tried duolingo for three months and it was an absolute game changer in my opinion. I was blown away by its creative ways of making you learn new words and essentially a whole new language. Recommend it to everyone! Definitely worth a try! That’s a great description of Duolingo, “Game changer”. 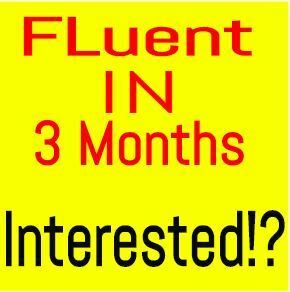 It can definitely be a game changer for many people who want to learn languages. It makes it so much easier and more fun than a regular classroom studying. One thing I noticed though was a that a native tongue French speaker was saying that the accents were a bit off. I’m not sure if Duolingo was speaking in the France accents (the native speaker was from the West Indies). Duolingo also helped me to learn French. To be honest, I wouldn’t be so worried about the accent. There are tens of different accents and dialects in every language so little nuances don’t matter so much in everyday life. That is what I figured as well. I was concerned though since a native French speaker did understand what I was saying lol! 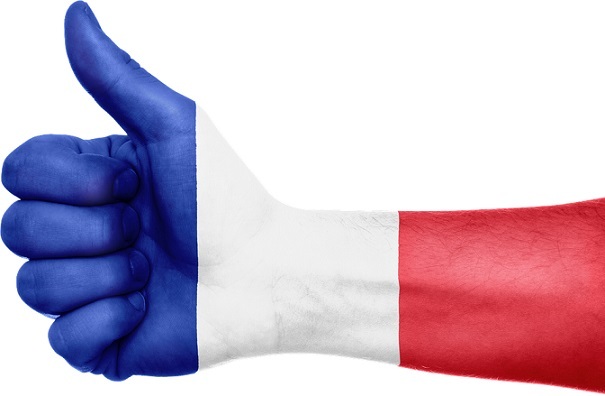 I know French is spoken all around the world so I hope someone somewhere understands me lol! Check out Speechling and Mimic Method. Those resources will improve your French pronunciation a lot. I absolutely love Duolingo. The mix of writing/reading/speaking/listening is great, since you get to cover the whole spectrum. I also like the testing system where, if you’ve studied a language before, you can test on the basic knowledge and skip through it to unlock the more difficult lessons. The social networking type aspect is really cool too, or, would be if I had more friends learning languages 😉 Not to mention I’m a huge sucker for achievements. Great to hear that you have enjoyed Duolingo. Is not a coincidence that it’s probably the most popular language learning game in the world right now. I can absolutely see why it’s the most popular. I’ve been trying a few others out just to kind of see what else is around, but Duolingo is still at the top. Super intuitive interface, while some of the others don’t seem very user friendly. Maybe that’s just because I got so used to Duolingo though so others feel weird now.